On that sunny Tuesday morning eleven years ago, I was sitting in a conference room high above Madison Avenue. The start-up I had co-founded had no business being housed at such a fancy address, but our investors had gotten us a great deal on the rent, and we were still feeling bullish: if the spreadsheets were right (they weren’t), the business would take off very soon. Affinity groups. Aggregate purchasing power. Network effects. These were the preoccupations that had consumed the previous two years; in fact, until that morning, I had thought about little else since mid-1999. Time stopped after we got word that a plane, a big plane, had hit a building. Those things which had seemed so urgent just moments before were dropped, and when we heard about the second plane, we all dispersed, in search of information as much as anything. The news was too strange to believe, and our cell phones had become useless; going outside to look for ourselves seemed like the most logical thing to do. The rest of the day was spent huddled around a television in a friend’s apartment on 57th Street. By then, we had breathed for blocks that acrid air, and we had seen for ourselves the impossible—that the towers were no longer in their place in the sky. But watching it all as TV news, it still felt unreal. In the late afternoon, my boyfriend and I walked home to Brooklyn. It took an hour or so to get downtown and even longer to make our way across the Brooklyn Bridge. Everyone moved slowly, and people were kind to one another, as if we were no longer strangers. In the days and weeks that followed 9/11, one thing that struck me again and again was this: so many of the people who died in those attacks were at work. Flying to a meeting. Sitting at a desk. Waiting tables. Washing windows. Roko Camaj, an Albanian immigrant who was killed in the attacks, had worked as a window washer at the World Trade Center for 26 years. On that Tuesday, the most ordinary routines were shattered in the most unthinkable way. Two New Yorkers I’ve interviewed for Work Stew were also on the job that day: Jane Viau was a VP at Merrill Lynch, and Christine O’Connor was an administrative assistant for a contractor. Shortly after 9/11, both made radical life changes. Viau decided to leave her 16-year finance career to become a high school math teacher; she has been teaching at the Frederick Douglass Academy, a public school in Harlem, for the past ten years. O’Connor applied to the New York City fire department and, after a long and arduous evaluation process, she was eventually accepted. Today, she is one of only 28 women among New York’s roughly 10,000 firefighters. Why do I mention these people and their stories? Why am I sharing my own? 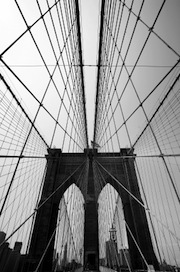 Because to a large extent, the dazed confusion of that walk across the Brooklyn Bridge is still with me. Nothing made sense on 9/11, and the only way I can even begin to think about it is person by person, story by story. You? I’m so glad you shared this, Kate. And I’m glad that you were kept safe under a beautiful blue sky when the unthinkable happened, for many reasons, but among them so that one day you could be my friend. The only thing that really makes sense to me about that day are the relationships revealed by it, enhanced by it, and created by it. There may always be people willing to fly planes into buildings, but there will always be more whose last act will be to tell someone they love them. The love inside, you take it with you. Patrick Swayze got that one right, I’m sure of it. Amy, that is beautiful. Thank you. You, Steve, and Lara were my family at that time, and we experienced those difficult days together. You all made it more barable. Thank you for posting this. A great posting Kate. I recall that I was on a telecon from the UK to the US at the time , engaged on a high-profile transaction. The news came through, and the telecon dispersed rapidly. The transaction itself was aborted in the immediate aftermath of the event. For a while nothing was quite the same. But now we need to extend the same empathy to those people on the ground in Syria and Iraq whose lives are being shattered by the same mindless destruction. “But now we need to extend the same empathy to those people on the ground in Syria and Iraq whose lives are being shattered by the same mindless destruction.” So true, Peter. We Americans can be very insular–your comment was a good reminder for me to read.